I got the Apple Pencil but where’s the holder? Should I keep it in my pocket, bag or on my pony tail. Ah! I must find out something to keep it safely. This would be the curiosity that running out in your small scale intellect now. Don’t worry dear valued customers. We got a surprise for you with a 4 in 1 functional gizmo that you’re find for. We gladly would like to announce our new product. Its “Quarter” time. Yeah, it’s a new solution to keep your $99 Apple pencil in a safe zone. Quarter is a connector and holder between Apple Pencil and IPad Pro. This gizmo is created to bring satisfaction to dedicated users. 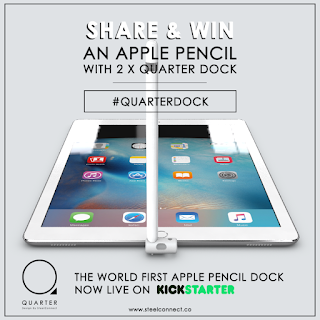 Quarter is 4 in 1 functional, it means you can hold, dock, charge and lock your Apple Pencil. Sounds cool right. Yeah! So, what you guys waiting for? Let become our backers at Kickstarter to get the promo price of the product. It’s just £5 only. The product were launched on 23rd October 2015, in just 48 hours we got 50% of backers. Unbelievable and the current backers are now increased to 93.4%. Slide your mousey and click here to login our Kickstarter page and support us now. Duration: from NOW until 22th November 2015. **Lucky Draw will only be commence if the campaign is successfully funded. 1 x Grand Reward and 5 x lucky participants. When and how will i receive the prize? We will be shipping to the winners on December with Standard International shipping. What i should do to participate? Easy! 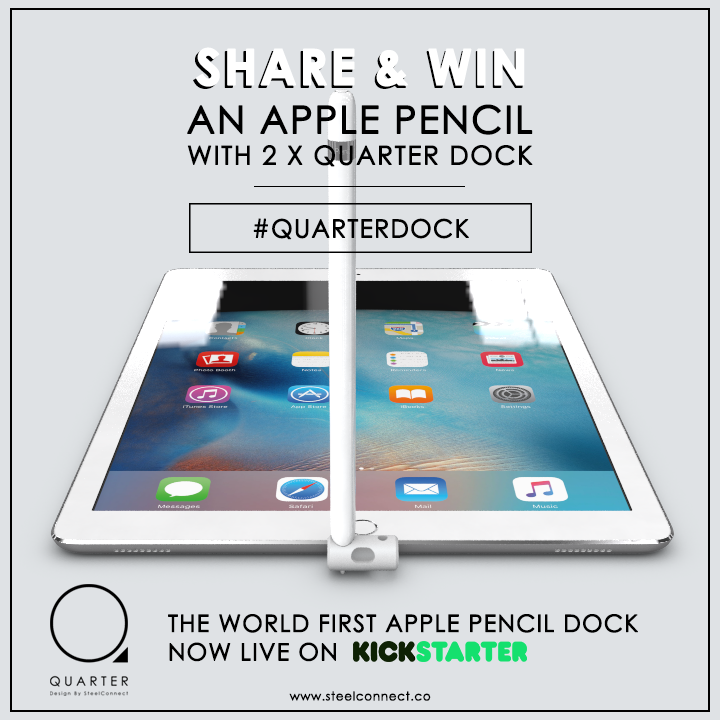 Just share the link or photos we post with the SHARE & WIN band (depends on the social platform you are using) most importantly you need to HASHTAG #QUARTERDOCK. This is how we can track your entries. There is no maximum entries per participants throughout the campaign but only 1 entries will be collected per day per social platform. You can share as many as you want and each share is entitled for one entries. The more you share along the campaign, the more entries you have in the draw box! 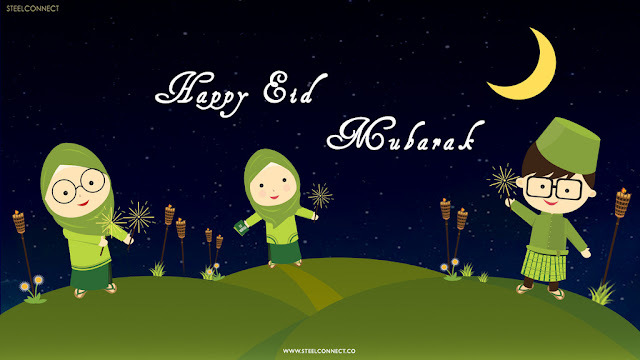 All the best & thank you for sharing. - just click the share button under the post we talk about the contest. We will hunt you down from the button. - one very important tips is that, your privacy setting. If you are set as private user we are unable to see you. Kindly change your setting on 23rd of November for a day until we finish collecting all your entries. We will be having the draw 1 to 2 days after the campaign and winner will be announce via social medias. **** all untraceable entries will not be entertain after the draw. ** Don't worry, we do not want you to flood your newsfeed with the same photos everyday. We will be posting more interesting photos from time to time. Any photos with our SHARE & WIN band are entitled for entries. Cheers! Thank you for sharing & Good Luck! We hope you enjoy the contest too. Drop us a message at support@steelconnect.co if you have any further questions about the contest. Here is a little preview of how we did our previous lucky draw campaign! Hope you're excited about the next one! Cheers!